I feel that I'm far from having the credentials or qualifications to review a game, however as I'm want to talk quite a bit about video games, I'll be happy to share my impressions and opinions on this blog. Far Cry 3 ended up being my only physically packaged "full release" video game acquisition of 2012 (2013 should keep my thumbs busier). Some lists have placed it among the years best games, especially among shooters, so I'm hoping my patience will be rewarded. There may be some spoilers below, but I'll try to keep things to a minimum. Disclaimer; I've not played the original Far Cry. 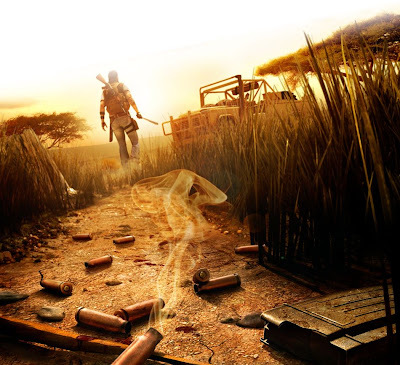 I did however play, enjoy, and recommend Far Cry 2, Ubisoft's first Far Cry release following their purchasing the rights to the Far Cry brand and franchise from Crytek. Far Cry 2, released in 2008 was a very good game. The problem was that it could have been great. When so much is so well executed, small flaws can seem gargantuan. When those flaws aren't so small, the can do what they did in Far Cry 2 and prevent it from reaching true greatness. In their second outing with the franchise, Ubisoft Montreal fixed much of what ailed it's predecessor. Sadly they might have also thrown a baby or two out with the bathwater. That said, what remains is a game that not only succeeds at bringing the Far Cry franchise to a wider audience, but also just may be the game that is the culmination of this entire console generations advancements. 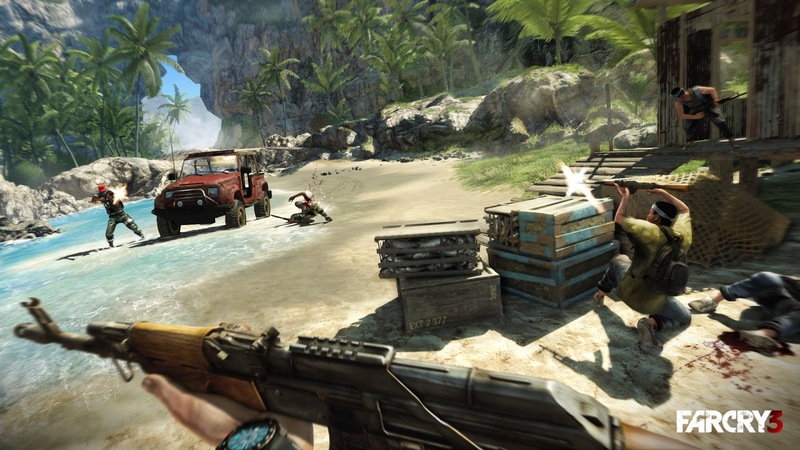 Far Cry 2 was billed almost as a "Make Your Own Story" sandbox experience. You had a choice of character you play (though that really just meant who's hands do you see holding guns and swinging into jeeps) and the "story" elements weren't so much a narrative as they were simply a way to add life and "realism" to your sandbox world. Now, as Jason Brody (who certainly puts the "bro" in Brody), you have a fleshed out backstory, dialog, and a far more hollywood-y or videogame-y action adventure story to play through. You have plenty of things to do on the island branching off of that story, but even while traipsing around the Rook Islands looking for a cassowary to kill that you can skin and craft into a new wallet (yes there's crafting this time around), you're bound to come across various memory cards or "Letter's of the Lost" to shed light on your mysterious vacation land and the larger story as a whole. Even with this still being a "sandbox" environment, the main story is quite linear to the point that, as of this writing (admittedly only about 25% through the game), the main missions are single file unlike the Grand Theft Auto approach of multiple story lines that can be accessed at the same time. Adding even more handholding are a few orchestrated missions where you end up seeking out yellow dots (think Call of Duty) more than finding your own way. One such mission led to an "on rails" sequence lifted straight from Uncharted: Drake's Adventure. This isn't entirely a bad thing, as it's still a rather fun game that, when allowed, rewards creativity. You'll be sure to enjoy scenarios such as planting C4 on a shed, starting a fire on the other side of a camp corralling your enemies towards that same shed and then detonating the explosives. While there are absolute new features, such as crafting, there are changes made from Far Cry 2, some better than others. For example, in Far Cry 2 enemy checkpoints were notorious in that after you cleared them, the next time you come back they were completely restaffed and as pissed at you as ever. Just like every other inhabitant of Far Cry 2's world who would drop whatever errand they were doing just to chase after and try to kill you. In this new installment, enemy checkpoints are claimed by you as a safe house after they've been cleared. Allowing for fast travel, equipment restocking, etc... Also, owning a checkpoint brings in friendlies (a rare sight to see in FC2) and the immediate area surrounding is now not a hostile environment. Cars and NPCs in non hostile environments will even peacefully pass you without trying to hunt you down! Far Cry 2 did it's best to keep you in the game world at all times, and it tried it's best to make it a "realistic" game world. It was a pioneer in the FPS genre in that you often saw your appendages and body when opening doors, swinging into jeeps etc. Also you never left into menu screens. Your Map and GPS were held by your character and you could easily have them open while moving in the world. Now, every time you want to look at the map you're pulled out of the game and into a shotty videogame map screen. A major misstep in my opinion. Also you're frequently pulled into another video game menu for crafting and skill trees (more on that in a second). Far Cry 2 had wildlife, but no predators. Far Cry 3 does. It works well and creates an even more unpredictable world when while you're stalking out an enemy position, a tiger may be stalking you. The best laid plans of mice and men often go awry...indeed. 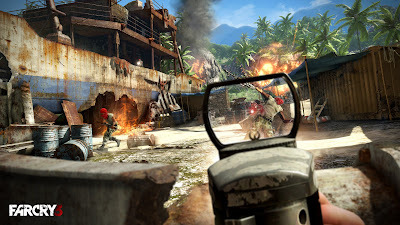 While in FC3 you're still able to scope out an enemy compound, highlighting the position of enemy combatants, you can no longer tag points of interest like gun installments, ammo stashes, and explosive areas. I miss that. But the trade off is in how you tag your enemies. This at first glance seems less realistic, but when enemies are tagged, you now get a silhouette of each tagged target even if outside your field of vision. Visually, this is very video-game-esque. However, in practice, it's a better representation of your actual awareness of people around you when hiding or behind a corner. Even with a surround sound headset, you don't quite get the sense of just how close they are, so this is an update I like...though if I was on the development team, I'd have a range limit to it where you only get this silhouette for close by enemies. One major change that I miss quite a bit, was the ability to set the time of day. From any safe house in Far Cry 2, you could go to bed and set an alarm to whatever time of day you'd like. Granted I used this more for environmental preferences other than strategic purposes. I preferred to attack my objectives as the sun rose. In Far Cry 3, time simply marches on with little control to no control. All changes aside, the game still works wonderfully and can't be marked down too much for any departures from it's predecessors. As far as production of the game, another element that stands out in the positive is some of the acting and motion capture. 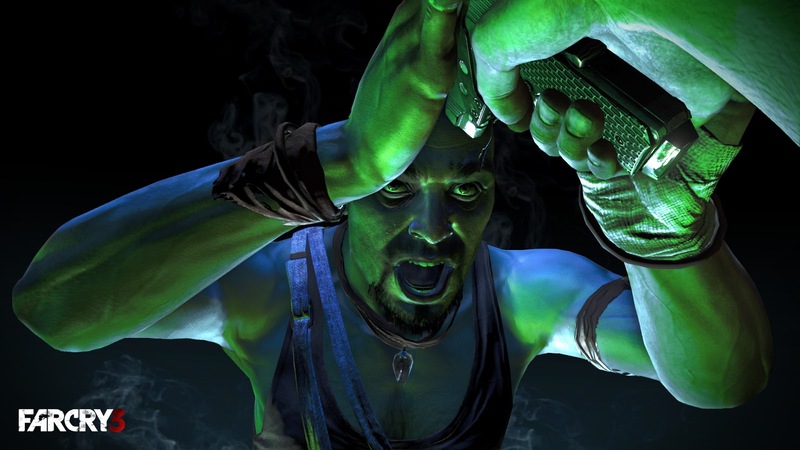 Vaas, played by Michael Mando steals the show. 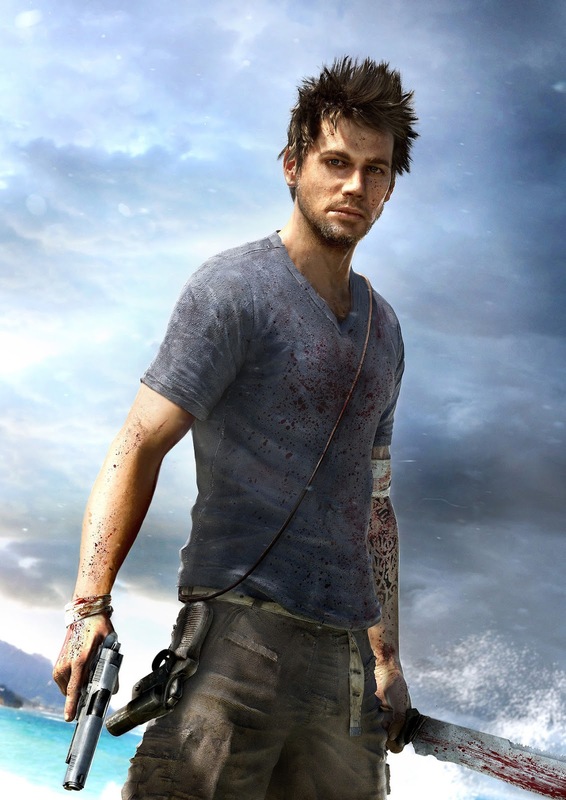 It would be easy to outdo the performance of Dwayne Hill's The Jackal, antagonist/mystery target of Far Cry 2. But Vaas' performance is one that more video games need to elevate to. This is on par with Uncharted performance, easy. Sadly, it highlights how terrible some of the other acting is. There's a scene which is obviously aiming to convey banter as fluid and fun as the best of Nathan Drake and Elena Fisher, but it falls very flat. I can only assume this is dialog recorded in separate sound booths, where the actors are just reading the lines and it's later stitched together, because that's how flat and artificial it sounds. Graphically, there is not a grand improvement on the PS3 version from Far Cry 2 to Far Cry 3, but that is surely due to the limitations of the system and not of the engine itself. Screen tear is ever present and some foliage looks flat. However, Far Cry 2 still stands high among graphical power houses on the PS3, so this is in no way a bad looking game. Ubisoft also successfully implemented a co-op mode for some online or offline fun with friends. You lose the open world, but you gain some extra value out of the game and it's definitely fun to raid a camp with a buddy. 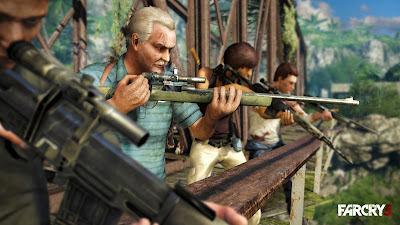 What make a Far Cry game such a pleasure is still there and in many cases has been improved. That is the freedom to get lost in the game world, approach each task however you'd like, and be challenged with good AI and progressively more difficult enemies. 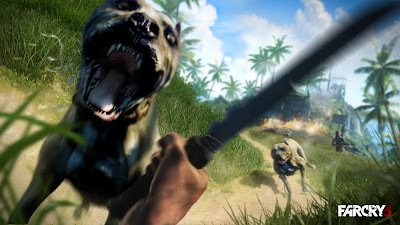 For a very in-depth trailer, go ahead and watch below, but the bottom line here is that in a year that was light on heavy hitter games, Far Cry 3 does a great job at bringing a quality game to an even larger audience than it's predecessors.